Nuummite (pronounced 'noo-mite') is a beautiful and unusual gemstone formed from a mixture of two minerals from the orthoamphibole group: anthophyllite and gedrite. It gets its name from the Municipality of Nuuk, in Greenland where it was discovered in 1982. Greenland is its only worldwide locality (although similar stones have been found in the USA, they are not actually Nuummite). Nuummite is believed to be one of, if not the oldest stone on the planet, and was formed of volcanic origin about 3 billion years ago. Environmental influences; changing environments throughout many millennia have effected the base rock (metamorphism), changing it to give us this quite spectacular, unique, iridescent stone. It has a high-shine, black base, but is filled with beautiful flashes of colours; greens, blues, yellows and reds and resonates with the 1st, 3rd and 7th chakras. 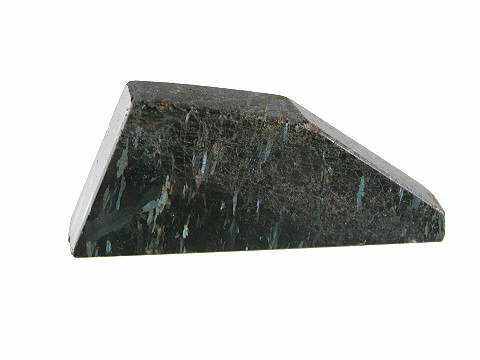 It is a powerful stone for meditation and is excellent to help overcome negative ego issues; especially those of self doubt and insecurity. Watch out for exorbitant prices for Nuummite. Due to its rarity pieces of this size exchange hands for sometimes twice the price we are asking, so as always, shop wisely and shop around!